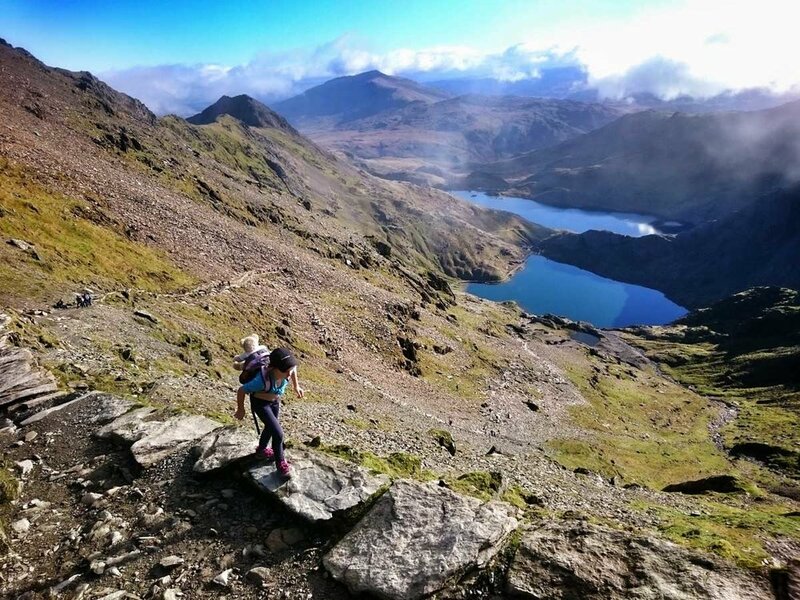 Climbing the early stages of the Pyg Track towards the pyramid peak of Crib Goch. I awoke to a pair of enormous wide brown eyes. "Morning Daddy! Can we get up now?" It was still early - still dark outside the steamed-up windows. But Amelia-Faie brimmed with excitement. "Yes, we can get up." An early start wasn't such a bad idea. Today, we'd be climbing Snowdon, and while Amelia-Faie had already climbed fells in Lakeland and Beacons in Brecon, this would be her biggest mountain yet, and her little legs would likely take longer than the 6-hours usually quoted for the round trip from Pen Y Pass. The air was still bitterly cold as we left our car, but light had begun to spread across the sky, and our head torches could be packed away from the start. We set off along the Pyg Track at a slow pace. ; not just slow enough so that Amelia-Faie could keep up with me, but slow enough to ensure it was a relaxed pace for her. We stopped a couple of times early on. Her limbs were still warming up and adapting to the uneven stone steps, and with all the time in the world to play with, the odd short break - even so early in the day - wouldn't hurt. Besides, as the dawn broke over the crags, it poured a glorious morning over the mountains, and stopping to admire it was no hardship. The morning continued to impress as we clambered over the ladder stiles at Bwlch y Moch, exploding light across the water of Llyn Llydaw. Nelson the bear bobbled merrily in Amelia-Faie's rucksack as she sauntered along the path, fuelled by Gummy Bears and adventure. There were further, regular stops; some for snackage, some to pose for pictures, and some to just admire the scenery. Amelia-Faie was loving it. She seemed to be in her natural element. The mountain had begun to get busy, and we soon had lots of company on the paths, particularly after the Pyg and Miners' Tracks merged above Glaslyn. Amelia-Faie liked to say hello to every dog she saw, a charming enough thing, but one that also would add time to the day. But, still, there was lots of it left. Climbing high above Snowdon's lakes. With the sun beaming on Snowdonia, I ensured there were also regular pauses to take on water. Amelia-Faie carried her own bottle, plus hat, gloves, and extra layers. Along with my kit and our food, my pack also contained a confidence rope, an emergency shelter, and a first aid kit. Only the last of these was used. With what she described as "a bit of a sore toe" requiring treatment, I checked for signs of rubbing or blisters (there were none) before applying a small dab of 'placebo cream' which seemed to sort the problem. With the top of the mountain almost within reach, the billowing clouds of the steam engine could be seen drifting towards the summit. It's a point of pride that Amelia-Faie had never expressed any interest in taking the train. For her, reaching the top of the mountain means climbing it yourself. I like that. As we emerged from the Pyg Track onto the summit ridge the crowds grew again as we were joined by the folk arriving on the Llanberis Path. To the south, thin clouds floated lazily above Cwm Clogwyn but below us. Amelia-Faie had never stood above the clouds before. She was impressed. But she also had summit fever coursing through her veins by now. "Is that the top?" She waved her shortened walking pole towards the elevated plinth silhouetted on the skyline. "Sure is" I replied. And with that she was off. This is what the day had been about for Amelia-Faie - getting to top, on her own and unaided. And she'd done it. We joined the queue to get our summit selfie, left the artificial cairn to enjoy the scenery with a bit more space to ourselves, and then headed into the visitor centre that divides opinion amongst Snowdon summiteers. Did we need to go in? No - Amelia-Faie would have been happy to sit and eat her sandwiches outside before walking down. But was it nice for her to sit with a hot chocolate telling strangers who'd just got off the train that she'd walked up with her Daddy? Absolutely. Plus, she got to buy a summit fridge magnet to take home for Mum. Paddling, splashing, and enjoying life in the mountains. On our way back down, this time on the Miners' Track, we took a closer look at the wooden posts spined with coins, the intriguing entrances to mine workings ("No, Amelia-Faie, you can't go in"), and even had time for a paddle around the beach-like shore of Glaslyn, splashing stones and skimming rocks beneath the peak we'd stood on top of earlier in the day. With feet dried and boots back on we set off once mores. The sun was beginning to drop - still bright and warming, but its hue increasingly duskish, and the shadows it cast lengthening. Amelia-Faie seemed to have energy left to spare. She took my hand and skipped as we neared Pen-y-Pass. She'd sleep well in the car home that night. And her dreams would be peppered with the memories of our day, memories that will stay with her, and me, forever. *it's a play on our name - geddit?